Ill be spending christmas in Uganda and setting up a business here after 6 months in India. Also looking forward to celebrating my ridiculously precious daughter Tyra’s third birthday. The rural internet connection is likely to be dreadful (this is from the airport), and already learning my lesson from yesterday its unwise to rush a post because of a dodgy connection (in the middle of the Indian Ocean) and then see the connection go down and not be able to correct it. So don’t expect much for a few weeks. Corrected 28/11, sorry would have done earlier but travelling from a 1,000km from nowhere and no chance to do so in last 9 hours. Telegraph (have they taken down the firewall). Nick Boles, a Conservative minister appointed in the September reshuffle, wants to increase the amount of land built on in England by a third. He insists that he wants to ensure the countryside is not filled with unattractive modern housing by “lazy” builders. He says that, rather than fight all development, people have to recognise that some buildings could be more beautiful than nature itself. But his comments come as much of England and Wales has been hit by flooding, which in some parts has been made worse by planners allowing development on natural flood plains which are meant to fill with water. In an interview with BBC Two’s Newsnight tonight, Mr Boles says nine per cent of England has been built on so far – and this should be increased to 12 per cent to meet demand. This would mean the amount of land paved over would increase from 4,531 sq m to more than 6,000 sq m. The 1,510 sq m increase is more than twice the 607 sq m area covered by Greater London. Building more on greenfield sites is possible because planning reforms announced in March only offered explicit protection for green belt land around towns and cities. Mr Boles says: “We’re going to protect the green belt – but if people want to have housing for their kids they have got to accept we need to build more on some open land. A report last year from the Institute of Public Policy Research think tank warned of a housing supply “black hole” by 2025 when England will face a shortfall of 750,000 homes. Figures from market analysts Glenigan show that in 2011 only 115,000 homes were given planning permission in England, compared with 212,000 at the height of the housing boom in 2007. Mr Boles suggests that people who oppose more development are being selfish for denying adequate space for their children and grandchildren. “It’s my job to make the arguments to these people [those who oppose development] that if they carry on writing letters their kids are never going to get a place with a garden to bring up their grandkids. Mr Boles adds: “I think everyone has the right to live somewhere that is not just affordable but that is beautiful and has some green space nearby.” He calls this “a basic moral right, like health care and education”. He risks offending millions of people living in England’s suburbs by again using the phrase “pig ugly” to describe many new estates in a speech tomorrow, singling out an estate in Purfleet, Essex, as a particular example. Countryside campaigners have been on high alert about Mr Boles’s intentions since he was appointed. In September, in his first Commons appearance as planning minister, he said green belt land was only safe from development “for now”. In January he described countryside campaigners as “hysterical, scaremongering latter-day Luddites”. There are concerns he wants to rip up the delicate consensus around planning after national policy was set in March. The Daily Telegraph led a Hands Off Our Land campaign before the policy was set, urging the Government not to weaken protections for greenfield and green belt land. An epitath for localism if ever there was one. Lets test this projection by our Minister for Central Planning. By when? Land covered by urbanisation is a stock figure, rate of development is a flow figure. Presuming if we hypothetically did build to meet housing need plus some clearance of backlog in a few years we would reach a point where housing supply year on year matched housing need, but the land cover by urbanisation would not stop it would keep on growing. Because Boles does not put a date on this it makes it very difficult to test, and easy for people to attack him as they will say where will it stop- 100% by 2500? The 9% figure is taken from the land cover rather than the rural/urban boundary statistics and is the most generous of the interpretation excluding semi-urban land covers. If you take the urban rural boundary stats (which are now being updated) we are already around 12-13%. Boles seems to be quoiting a poorly informed Policy Exchange report rather than his own governments official statistics – your in a new job man. So lets test the assumptions with what little data we have. I must say an official projection of future urbanisation trends/options should have been done, and gis modelled, as part of a spatial planning framework for England, but I digress. If anyone out there wants to pay for a proper GIS based simulation I am more than willing. Lets say new development manages to achieve a mean gross density of 30 dwellings per hectare, and that the exaction rate, taking account of roads, parks, schools, SUDS, etc. is a typical 50%. That would mean that 100,000 dwellings would cover 6,666 Ha, or around 66.6 SQKM. But of course not all of this will be on greenfield sites. It would be a great mistake to suggest that the current % figure for developing on brownfield sites could be projected forward whatever the rate of development overall, almost as great a mistake as that in the Impact Assessment for the NPPF which was based on the assumption that brownfield sites were a once for all stock that would never be replenished in the future. That is because brownfield (PDL) sites come forward at a steady rate (a flow) which rises when the market for housing is highest but not proportionately If were to do this properly (paid) i’d do a regression function, but for back of the envelope simplicity lets say that brownfield developments stay at around the current level (the last data we have is from 2010 and the link is broken (even the data.gov link is broken – DMS government?) since DCLG moved to gov.uk sorry) and rose a little to around 100,000 dwellings a year indicating some success with urban regeneration – a generous assumption given current policy. Lets assume a return to a healthy level of housebuilding meeting housing need (230,000 a year) with adjustments for frictional vacancies and demolitions and other technical adjustments that equates to around 246,000 dwellings a year. If we were to clear the backlog over 20 years or so as IPPR suggest that would need to rise to 300,000 dwellings a year.So lets assume for the sake of argument that we did build 300,000 dwellings a year till 2042 and then the level of housebuilding dropped to 250,000 a year. So how long then would it take up to eat up an extra 3% of England? England is around 130,000 Sqkm. So 3% of that is 3,900 sqkm, slightly larger than Cornwall. By 2042 we would have consumed 4,000 sqm almost bang on. The Minister for Central Planning has exceed himself, not a 5 year plan but a 20 year one. an ‘overbearing and unbroken slab of dismal brickwork that is an insult to the community it borders’. he visited Purfleet a short while ago. A lack of imagination, no design brief and the dominance of car parking are all to blame for the bad design of Harrisons Wharf. The scheme, which consists of 103 flats overlooking the River Thames in Purfleet, was always going to be a difficult project for developers Bellway Homes. When plans were first drawn up the site was operating as an aggregates yard, was surrounded by other industrial units and faced onto a semi-derelict riverside. But a lack of flair in the design has resulted in riverside development that does not have direct pedestrian access to the actual river. A design brief was not produced for this site due to limited resources, this resulted in an absence of clear guidance from the local authority and limited amount of early communication with the developer. Remedial action has now had to be taken to improve the development’s connection with the surrounding area. Two inspectors reports on called in cases, both in areas earmarked/safeguarded for development of long term needs a long time ago. One in Swindon, the Other in Harlow. although the Framework endorses a plan led system, there is no adopted development plan that identifies sufficient housing to meet the clear housing land shortfall. The emerging LP will no doubt seek to address this problem but this is still at a very early stage. National policy is that every effort should be made to identify and then meet the housing needs of an area. The housing need in Harlow is established, and the appeal scheme would make a significant contribution towards meeting that need. Waiting for the emergence of the LP would not accord with national policy. And in the Swindon case (not yet on the DCLG website). he agrees that the weight to be given to objections on prematurity grounds is not so great as to indicate that this, alone, should result in a refusal of planning permission“. I should note that even before the NPPF prematurity could not be the sole reason for refusal so in effect we now have a return to pre-Pickles, pre (faux)-localism planning policy days. The Wiltshire case is more interesting as here we have a submitted core strategy (the site is outside Swindon in the Wiltshire CS area). 40. Given the wide range of developments which could be included within the new commercial or business category, and the focus on providing this as an opt-in route for developers with the vast majority of business and commercial applications remaining with local authorities for decision, we do not think the case for one or more National Policy Statements is strong. The National Planning Policy Framework, together with other important and relevant considerations such as local plan policies, could provide a policy framework for decision making on business and commercial developments. The Government does not therefore intend to prepare National Policy Statements for the new category of business and commercial development. The problem of course is that para. 40 is not on the face of the 2008 act (as amended and proposed to be amended). Their is no presumption in favour of the local plan in the 2008 regime and the NPPF provides no spatial guidance at all on major infrastructure proposals. Mixed-use development including, for example, mixed-use business parks. We envisage that offices and research and development facilities would be broadly equivalent to use class B1; manufacturing and processing proposals to use classes B1(c) and B2; and warehousing, storage and distribution to use class B8. An obvious omission is petrochemical works, as a former special industry this is sui-generic and lies outside B2. A surprise inclusion is sports stadia, which to my mind local planners have shown themselves more than capable of handling (examples are legion), the problem is the local Councillors who cannot vote because of being season ticket holders etc. Sorry this proposal is bonkers – much like Mumbai’s whole approach to FAR (FSI here). A overly restrictive policy and archaic property laws create huge developer pressure, temporary perverse politics sees providing parking spaces as a solution, so developers push the public benefits bonus policy to the max. But Mumbai has the best suburban railway network in India and a metro under advanced state of planning. In a few years time when it developers a rational transport plan it will be trying to reduce not increase commuter parking on the ‘island’. Lets hope they see sense. By the way the 4 FAR bonus is huge, San Paulo manages to be a high rise city that grinds to a with traffic on a FAR of 2.5. which allows 15 story buildings easily on larger sites. Thre is a golden rule here, once you start allowing for tall buildings you must must must restrict car use, otherwise your city grinds to a halt or worse such as some of the worlds tallest buildings serviced solely by car proposals we have seen in Saudi a proposal that is physically impossible to service for commuters. Note: This is my first post about planning in India, because it involves a city in which I have no project involvement. MUMBAI: The state government has approved 32 public parking lots under the revised parking floor space index (FSI) policy, creating space for over 30,000 vehicles in the city. Of the 32 approved parking spaces, 20 are located in the island city, nine in the western suburbs and three in the eastern suburbs. In all, the BMC received 70 proposals, of which 32 have so far been approved by the state government. Another 11 proposals cleared by the BMC are awaiting the government’s nod. To encourage private developers to build public parking lots, the state government in 2008 had announced a policy under the Development Control Regulation (DCR) 33(24) which would grant the developer up to four FSI in exchange for construction of parking lots. But the original policyhad to be revised after experts termed it as builder-driven. Under the revised policy, the parking lot floors are restricted up to four, the minimum area of the plot required to avail of the policy has been increased from 700 sqm to 1,000sqm in the island city and 2,000sqm in the suburbs. Under the original policy, builders had proposed to build 12-15 storeys of parking spaces in exchange for the huge bonanza in the form of additional floor space index (FSI), the ratio of which determines how much can be built on a plot. Under the old policy, the government had approved proposals for 26 parking lots of which 11 were given commencement certificates (CC). However, after the revised plan was announced they were asked to amend their plans and resubmit them to the BMC. The 32 approved proposals include 26 proposals which were amended and re-approved. “All the 32 parking lots have been approved as per the revised policy. Those that were given the CC earlier have made the changes or are in the process of making the changes to adhere to the revised norms,” said additional municipal commissioner Aseem Gupta. He added that the BMC has so far received Rs 250 crore as premium for the extra FSI. Once the construction of the parking lots is completed, the developer has to hand them over to the BMC which will operate them. Currently the BMC has 92 functioning parking lots in the city under the ‘pay and park’ scheme, with space to accommodate 10,314 vehicles. West Somerset – Aging, Declining, Unviable? One of the most striking figures from the newly released 2011 census preliminary results is that West Somerset District, in marked stand out from the rest of the South West, is losing population. -1.1% 2001-2011. What minhead needs of course is another couple of thousand houses (reversing the decline of the last 40 years) and the jobs to go with it. The town though is notoriously penned in by the National Park on three sides and a narrow coastal strip between Dunster and The Sea on the fourth. I have a bold solution – but desperate times require bold solutions. Release the West Somerset and Minehead Golf Course for development, and land to the South, indeed secure it by CPO if necessary, and encourage the adjoining Butlins to release the lower density parts of its huge site immediately to the south. This would create the plummest and largest coastal development site in the South West, which could have its own dedicated stop on the West Somerset Railway, indeed the scheme could fund the ‘de-beeching’ of the line, a proper regular DMU service could make Minehead a viable commuting destination for the rest of Somerset and draw young people back into the town. To sceptics, Minehead has seen this before, indeed much of the heritage and beauty of the town has been to successive releases of land by estate owners. A seaside Garden City, if that cannot revive Minehead nothing can. The UKELA-PEBA Debate. Does the #NPPF require a test of whether or not Development is Sustainable? From the joint seminar last week I hear of a debate between John Rhodes, one of the PAG four, who said the NPPF doesn’t require a test of whether or not development is sustainable, and Ben Linscott of PINS who said it does. Who is right? John Rhodes- but its a narrow point. The NPPF contains a presumption in favour of sustainable development, not a requirement that development be sustainable let alone a presumption against unsustainable development, as a number of us pointed out during the consultation. The government at the Localism Bill debates in the lords resisted a clause that would define and require all schemes to be sustainable as they said it would lead to JR on many more schemes. There is a requirement to test whether a scheme is sustainable (in the narrow terms of the NPPF) in order to test whether or not the presumption in favour of sustainable development applies. But that doesn’t mean that schemes judged not to be sustainable are refused, simply that the presumption in favour (para 14) does not apply. The NPPF does not explicitly set out the decision test in such cases but of course the presumption in favour of the development plan still applies (paras 11,12) except where ‘absent, silent or relevant policies are out‑of‑date’. There is no requirement in the NPPF to demonstrate that schemes are sustainable, it is a special pass, those that do should be approved ‘without delay’. So it is legitimate, for example for a scheme for a supermarket on a site allocated in an up to date adopted plan, to say in the planning statement there is no need to demonstrate that the scheme is sustainable The onus of proof is not on the applicant but objectors to show that material considerations indicate otherwise. That would be a strange tactic as most developers would want the special pass of the presumption, but legally quite legitimate. If that scheme subsequently went to appeal and objectors demonstrated that the local plan was out of date for not fully incorporating the sustainability principles of the NPPF the developer would be in trouble as the plan would be ‘out of date’ and their would be a presumption in favour of the plan/development. So technically John Rhodes is right, though in practice iif you dont demonstrate sustainability in terms of the NPPF then you risk undermining your own case in terms of the development plan. A more day to day application of these principles though is domestic extensions. How could a case by case examination of the sustainability of these schemes be practical? This demonstrates again the weakeness of the English (as opposed to Scottish) system in not taking into full account the Dobry principles of amending the decision tests and evidence requirements based on the impact and scale of the scheme, We are slowly getting there, but not yet. Building Design Where is the RTPI in all this? RIBA president Angela Brady is speaking to the ‘zero fees’ housing association later today in an attempt to get it to drop the idea. Last week BD revealed that Sanctuary Housing Association had told architects interested in getting on a framework that it wouldn’t pay fees if planning permission was not awarded or Sanctuary binned a scheme before it went to planning. Under the terms of the framework – which is known as Scape and operated by six local authorities – architects will have to pay a further 8% of their total fees to F&G. Fees for schemes that do go ahead will be 1.9% – 0.9% for RIBA stages A-H and the remainder for stages J-L.
Condemnation of Sanctuary’s proposals has extended to former employees with the last head of its in-house architecture team calling them “immoral”. The last and rather desperate objection to any form of greenfield housing development is to say ‘it flooded in 1967’ or some such. This week, in the UK with the worst rains for a few years there will be many who will say ‘I told you so’ (im in the Seychelles on the way to Uganda on business with tropical storms abounding but can remember British rain). One such is from Cllr Keith Kondakor (@greennuneaton) below, the site was approved for a Barrets scheme the week before. Sorry Cllr ITS JUST A PUDDLE it will bother noone except a few cows feet. Any greenfield anywhere in England will have a rainfall absorption capacity that if exceeded will lead to minor and temporary flooding of lower lying portions. Where then to locate development if not flat areas, steep areas also leads to runoff on other sites and with less opportunity to create settling ponds, SUDS etc. Of course the EA on large sites will insist on its 100% absorption of run off on site policy. 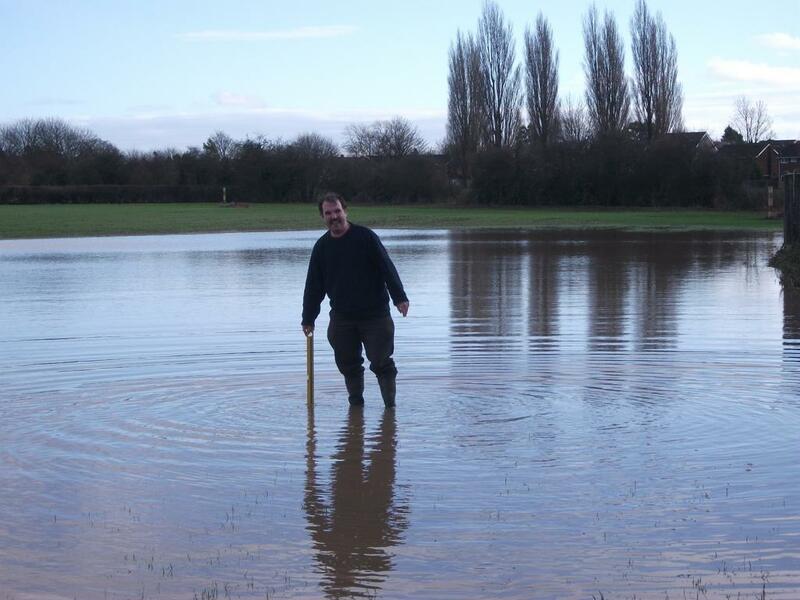 In fact puddles of a few inches only is a good sign as it indicates that the field can absorb water without it flowing into watercourses, if these natural dips are deepened then there can be no technical objection to development. Surface water runoff (as opposed to fluvial flooding) is only in a small number of cases a severe problem, such as steep valleys with denuded forest cover, where natural run off is bottled up by road and railway embankments etc. and where street drainage is antiquated To see it become a universal and rather unscientific objection to anything is sadly a sign of how anti-development reflexes falsely proclaimed as ‘green’ have corrupted localism, which in many cases sadly is simply a synonym for putting emotionalism above evidence.